Following on from last year's Puttin' On The Ritz, a ballroom dancing showcase which celebrated the works of Irving Berlin, George Gershwin and Cole Porter, we have something of a follow-up in the form of Keep Dancing. 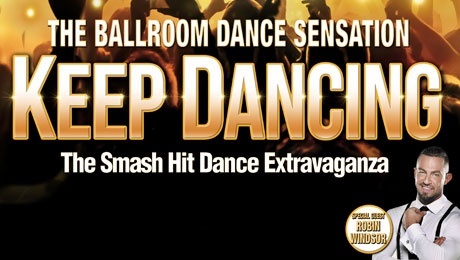 The biggest difference between the two shows comes in terms of the music which acts as the soundtrack for proceedings; in contrast to the early 20th century songs which are old favourites to longtime music lovers, Keep Dancing provided a mix of hits from the 1950s-to-1970s and some modern hits. Granted, there are nods to a fondly-remembered time when music was a lot simpler, but for the most part, Keep Dancing is a modern exhibition of ballroom dancing, at least in terms of the songs. However, there is one big similarity between Puttin' On The Ritz (which you can read my review of by clicking here) and Keep Dancing, and that is the outstanding quality of the dancing on display (which, of course, is the feature attraction). Anyone who has ever watched Strictly Come Dancing will know what to expect here, and they will likely be very impressed. The dance moves are eye-catching, complex and, most of all, spectacular. I wouldn't necessarily pick out certain routines as having a true "wow" factor, although the Hot Honey Rag (which admittedly had much in common with the similar routine for the Maple Leaf Rag in Puttin' On The Ritz), where nearly a dozen dancers sit on the edge of the stage in an increasingly-rapid and difficult-looking display of hand- and thigh-clapping, including criss-crossing and additional arm movements, was definitely the most eye-catching and well-received performance of the evening. But the standard of the dancing was high throughout the show, led by the superb combination of Robin Windsor and Anya Garnis, both of Strictly Come Dancing fame, who were amazing and extremely professional throughout; the show reached a higher level when they were on stage doing their thing, and doing it very well indeed. However, the back-up dancers were all very good too (so much so that they all deserve a mention here: Mason Boyce, Aaron Brown, Victoria Burke, Florence Edge, Yanet Fuentes, Jordan Hinchliffe, Joshua Moore, Shane Seal, Lisa Welham and Rose Wild), and the routines varied from modern, funky dancing to a slow-paced, almost artistic representation of combat to classic vintage moves harking back to a bygone era. It is a feel-good show, and the dancing (which also included some guest spots by Louis Smith, British Olympian and winner of the 2012 series of Strictly) and choreography were brilliantly executed and very professionally produced. That being said, one cannot ignore the quality of the singing as well, because it was excellent. Both Lisa-Marie Holmes (who delivered a great rendition of Stormy Weather)and Harriette Mullen did themselves proud with a mixture of fast-paced, high-pitched funk numbers and some slower, quieter and more emotional renditions. It is hard to say which of the two stood out more for their vocal range and for the standard of their signing because both were superb. But Adam Warmington is also a very talented vocalist: he handled the songs which included the larger dance troupes, as well as those which delved into a different, Spanish salsa culture (which I will elaborate on shortly). The show is primarily about dancing, so it's easy to take the singing for granted, but even if this were a production that you were only listening to rather than watching, you would still come away with a high opinion of the performers; they add quality to an already-strong show. Some other observations: I liked the simplistic setting which ensured that your eyes remained solely on the performers rather than being distracted by anything else, although the flashy, Hollywood-esque semi-circular lighting frame that shone over the curtain prior to the show and during intermission was also a nice touch. In addition, spacing out the performers - almost to the point that the show seemed to have four quarters rather than two halves - was a smart move, as it ensured that no performer outstayed their welcome and that there was a sense of chronology to the routines, as well as keeping things fresh for those who may not have liked a particular song or dance. And the frequently-changing costumes were glitzy and colourful; those sported by the dancers during the final routines evoked thoughts of car wash brushes, which perhaps would have been more suited for the song Car Wash itself, as it definitely wouldn't have seemed out of place! On the downside, I felt that some of the performances were a little on the short side - certain early routines only slightly exceeded the two-minute mark - and that the show as a whole could have been given more time to breathe. With there being no overriding story, it wasn't a necessity to stretch the show any longer than it had to be, but I felt that another 15-20 minutes wouldn't have gone amiss. Some vocal arrangements were slightly different to what the audience may have preferred, particularly for I Want It That Way. And it was occasionally hard to tell when certain routines actually ended due to a slow fade into black, resulting in the odd awkward pause before the applause would commence. However, the positives definitely outweigh the negatives with this show. Simply put, if you're a fan of Strictly Come Dancing, or if you're a fan of ballroom dancing in general, then you should love Keep Dancing.